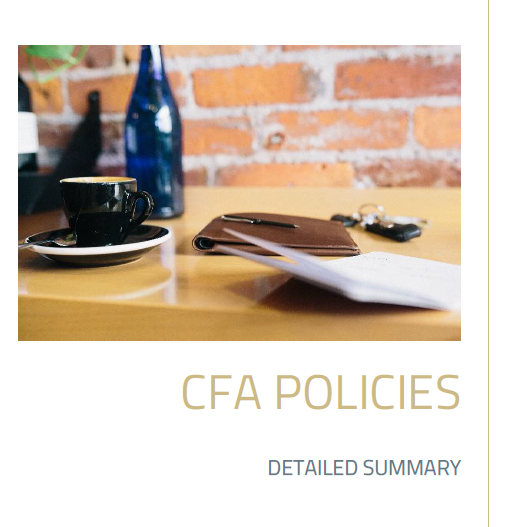 CFA exam is regulated by numerous policies. You must know them all or else you may cause yourself lots of trouble, including suspension from the CFA Program, termination of your participation or invalidation of your CFA exam results. Below, we give you the gist of CFA exam rules and regulations and refer them to phases of the CFA pathway at which they prove useful. These are the very basics you really need to know! Pre-exam policies govern the CFA registration process. To register for the CFA exam, you must have a valid international travel passport (no other IDs are permitted). If your passport has expired, you can use it to register but it must be updated before the exam. When you update your passport, you must update the required data in your registration account as well. CFA registration also involves fee payment. A full refund of fee payment (both enrollment and registration) is possible within 3 business days. Otherwise, there is no refund regardless of circumstances. You forfeit your fees if you want to back out of the CFA Program. After registration, for CFA level 1 only, a withdrawal option is provided. You need to submit an appropriate request form (it states the withdrawal deadline date!). Once the request is accepted, the withdrawal cannot be reversed. There is no refund or transfer of registration fees and you have to pay again if you decide to register for the same or upcoming exam. Do you want to know when the CFA level 1 withdrawal option is of help? Hewlett Packard 12C (including HP 12C Platinum, 12C Platinum 25th anniversary edition, 12C 30th anniversary edition, HP 12C Prestige). When choosing your CFA calculator, make no mistake and choose one of the above-mentioned. When organizing your exam day, allow for the check-in before every session (in the morning arrive at least one hour before the exam begins). You must bring your international travel passport and admission ticket with you. You will need both at the two check-ins. Remember that your passport has to be an up-to-date original document issued by your country and certifying your identity. The information stated on your passport must exactly match the information printed on your admission ticket or you will not be let into the testing room. Your admission ticket is also a document – it must be printed on an unused and decent piece of paper. Note that it is valid for an exact exam date and test center, which are given on the ticket. You will also not be admitted to the testing room if you are late more than half an hour after the exam starts. During the exam, you must remain seated in your designated place. Do not open or read your test before the start of the CFA test is announced. When doing the test, you must mark your answers on your answer sheet because only these answers are graded. Darken the whole oval (implying your answer) heavily with a No. 2 or HB pencil or black or blue ink pen. For CFA level 3 essays, write your answers only on designated answer pages with an approved pen or pencil. Stop immediately after the end of the test is announced. Do not remove any sheets from your exam and take nothing with you from the testing room but the things you brought. You must not leave the testing room before each session ends. Throughout your CFA exam, you must keep your passport, admission ticket, as well as an approved pen/pencil and calculator on your desk. There is a restricted list of things you may have with you in the testing room. All things not allowed during the CFA exam must be left in a designated area. Do you want to know what you can bring to the testing room? Remember Standard VII (A) of CFA Institute Code of Ethics and Standards of Professional Conduct? Check also there for useful information or watch our free video inside your free study plan. After you take your CFA exam, do not brag or complain about what was in the test you just took. You must not reveal any specific contents of the exam, or else you may end up being punished. There is a list of sanctions CFA Institute may use in case a candidate violates any of CFA laws. Your CFA certification also opens the issue of regulations set for CFA designation itself. As a CFA charterholder, you must obey certain rules concerning the way you use your title or talk about your CFA certification. Remember Standard VII (B) of CFA Institute Code of Ethics and Standards of Professional Conduct? Check also there for useful information or watch our free video inside your free study plan. The above is an apt summary of CFA policies. Nonetheless, we strongly encourage you to read all the terms and conditions that govern the CFA exam and CFA certification. You will be asked to read CFA exam policies before you are allowed to view your admission ticket. It is worth the time as it educates you about all effective regulations and keeps you away from any violation. Our summary definitely facilitates the reading.